The Leaf Wetness Sensors were created by Spectrum Technologies, Inc. as a low-maintenance tool in IPM systems for disease prediction and spray scheduling of outdoor field-grown crops. 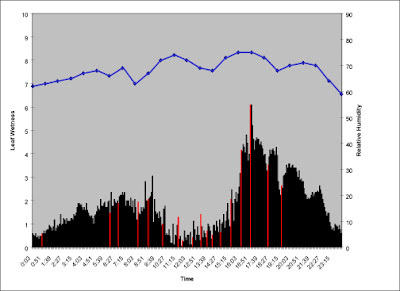 The logger records values of simulated leaf moisture between 0 (dry) and 15 (wet) which are used in quantifying cumulative hour above some disease threshold. Our work evaluated this instrument in a commercial hydroponic tomato greenhouse for the purpose of disease prediction and humidity control at various levels within the crop canopy. Data indicate that the sensors may also be used to improve irrigation scheduling with regard to disease prevention. Spectrum Technologies’ Leaf Wetness Data Logger and LogBook Software were used to record leaf wetness values over two 18 day periods. For the 18 day maximum interval, recordings are taken every 12 minutes. Relative humidity values and irrigation timings were recorded on the greenhouse’s Priva environmental control system. The sensor was stationed 1 meter above the floor within the crop canopy, at the same location for both monitoring periods. Examining the figures below, it can be observed that spikes in the leaf wetness values are generally preceded by irrigation intervals (red columns), with some cumulative effects occurring during periods of frequent irrigation. The timing of irrigations is controlled by the Priva system according to maximum time intervals over four periods during each day, and to quantities of incoming light received following the previous irrigation. It may be assumed that by analyzing daily leaf wetness fluctuations during the different seasons, environmental control settings can be selected which will allow for more appropriate irrigation timings in regard to reduced leaf wetness and disease prevention. 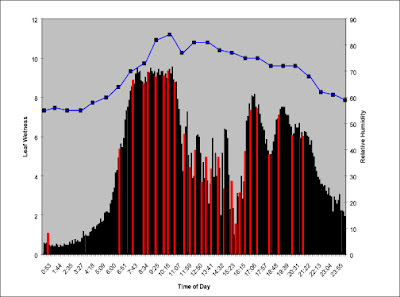 Leaf wetness (columns), relative humidity (blue line), and irrigation time (red columns) measured early February.